Dove Pure Care Dry Oil conditions all types of hair and scalp. All you need to do is apply a small amount of the cosmetic to see its complex action. You will see the effects at the very beginning of the treatment. When to use Dove Pure Care Dry Oil? You can use Dove Pure Care Dry Oil in every-day haircare. The cosmetic will come in useful for heat styling; after washing to moisturise the strands; as an add-on to masks or conditioners. You can use it on a daily basis, once a week or from time to time – it depends on the needs of your hair and scalp. Dove Cure Care Dry Oil provides internal as well as external action. What are the properties of Dove Pure Care Dry Oil? Dove Pure Care Dry Oil offers universal use. It provides scalp and hair with lots of nutrients, therefore hair grows strong and healthy. What is more, it protects from harmful external factors, makes your hair silky smooth and delivers healthy shine. 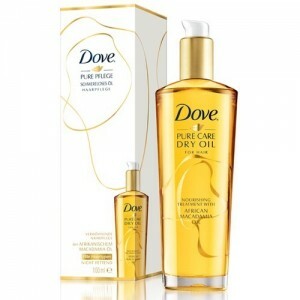 Light formula of Dove Pure Care Dry Oil is easily spread, quickly absorbed. It is non-greasy. How to use Dove Pure Care Dry Oil? There are three methods for using Dove Pure Care Dry Oil. Remember to wash your hair before every application and rub a small amount of the product between palms. You can also apply the oil before washing for nourishment: leave it in for 30 minutes. Next wash hair with a mild shampoo. What is more, Dove Pure Care Dry Oil can be applied after hair wash to moisturise the strands and add lustre. The cosmetic can also work as an excellent additive to other conditioning products e.g. masks, conditioners, serums.